A digital stopwatch is the best tool to calculate a golf ball's flight time. A golf ball's flight time is especially important during drives. The longer your ball is in the air, the more distance the drive has. Driving distance is an important attribute to have on any course, but especially on long courses. If you can hit long drives with accuracy, you often have less-challenging approach shots to make, which can help you lower your score. Recruit a playing partner to time your shot for you. Because you're busy making the shot, you won't be able to handle the timing duties. Equip the other golfer with a digital stopwatch and explain how to use it. If you don't have a digital stopwatch, use a timing app on a smartphone. Request that your playing partner press the "Start" button as soon as your clubhead makes impact with the ball. Pressing the button at the exact second of impact might be difficult; remind him to listen for the sound in addition to watching your swing. 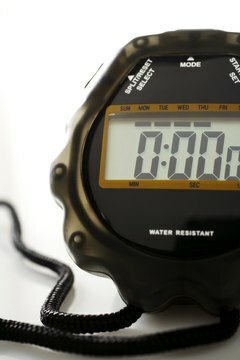 Arrange for your partner to press the digital stopwatch's "Stop" button as soon as he sees the ball land. Watching the ball's path ranges in difficulty according to the course. If necessary, equip him with a range finder or a set of binoculars. Note the time on the stopwatch after your partner stops it. This time is the approximate length of time your ball was in the air. What Is an Eagle in Golf Terms? What Does Eagle Mean in Golf Terms?